In case you were wondering, I’m still doing Weight Watchers (and I’ve lost 10 pounds–yay me!). It just feels weird to write about it all the time here. Anyway! I typically find it easy to stick to the plan for breakfast and dinner, and I’m not much of a snacker, so that’s not a problem either. But lunch has been difficult. I don’t like frozen foods and I’m not a big salad eater. I did sandwiches for a while, but I burnt out on those. I like some canned soups, but I’m trying to avoid them because of the whole BPA thing. When lunchtime rolls around, it’s usually, “Oh, what I’m going to eat? I guess I’ll have some potato chips and a tangerine.” So I’m not so much over-eating when it comes to lunch–it’s mostly just that I’m eating odd things. Things that don’t really constitute a meal. Not having time to whip up something from scratch on a daily basis, I’ve found that a good solution has been to make a big batch of soup on Sundays to eat during the work week. Soup is easy to heat up and I can have it with some fruit and one of my No-Bake Molasses Bites and it’s a filling (normal! non-potato chip!) meal. After a few weeks of various lentil soups, I’ve moved onto Asian-inspired ones. Last week, I found a recipe for Coconut-Lime Chicken Noodle Soup in Everyday Food (which apparently is so new, it’s not even up on Martha Stewart’s website yet–sorry, no link!) and I decided to adapt it to my tastes and diet to make Coconut-Lime Tofu Soup. I took out the chicken and noodles and added tofu and mushrooms instead. As I squeezed the lime juice into the pot, I was worried that the soup would be too lime-y for me, but it worked–it reminds me of the coconut soup that comes with the lunch special at our local Thai restaurant. 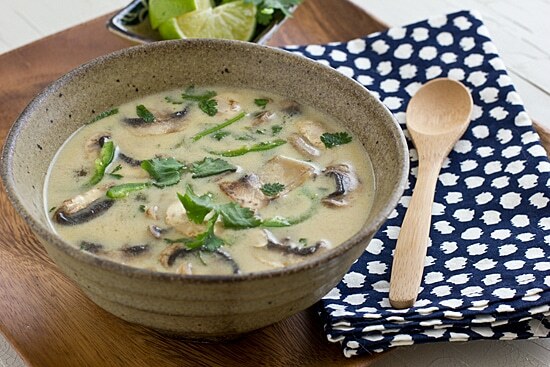 An Asian-inspired vegetarian soup with a coconut-lime broth, fresh mushrooms, and cubes of tofu. Adapted from Everyday Food’s Coconut-Lime Chicken Noodle Soup. Combine broth and ginger in a large pot and bring to a boil over high heat. Reduce heat to medium, cover, and simmer for 10 minutes. Add coconut milk to broth; return to a simmer. Stir in tofu and mushrooms; cook 3 minutes, or until mushrooms are tender. Add lime juice, soy sauce, brown sugar, jalapeno, and 1/2 cup of cilantro leaves to pot; cook 1 minute more. Garnish bowls with remaining cilantro. Can this soup be frozen? I like to make a few lunches, freeze them, and not worry about cooking for the week! I normally don’t go public but this one deserves it. I made this soup for guests tonight and it was a huge success. It was so easy and SO tasty and delicious! Thank you for your comment – I’m so glad you enjoyed the recipe! Tried this soup last night! It was delicious. I’ll definitely be trying it again soon!! Your ¨PRINT” function doesn´t work! Love this recipe, though!